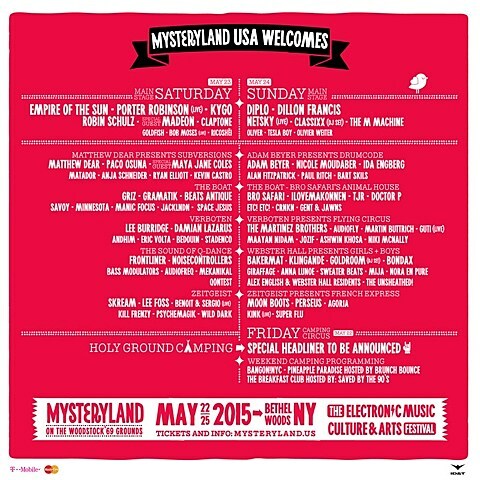 The first-ever US installment of electronic music festival Mysteryland took place last year at NY’s Bethel Woods Center for the Arts — the first festival to happen there since the original Woodstock. The festival returns this year on Memorial Day Weekend, May 22-25 with Diplo, Skream, Matthew Dear, Classixx, Dillon Francis, Empire of the Sun, Giraffage, iLoveMakonnen, Moon Boots, Psychemagik, Sweater Beats, Perseus, Goldroom, Bondax, Anna Lunoe and more. Tickets are on sale now. Full lineup below. Meanwhile, Giraffage plays NY much sooner. This week actually, at Output on Thursday (3/19). Tickets are on sale. Q-Dance Contest Winner – To Be Announced!